1 What is Lennox Gastaut Syndrome? 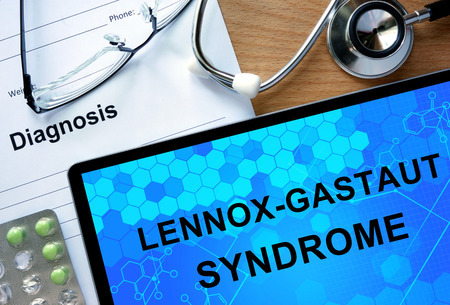 What is Lennox Gastaut Syndrome? Lennox Gastaut Syndrome (LGS), also called childhood epileptic encephalopathy, is a rare severe form of progressive epilepsy, characterized by multiple types of seizures that are most prominent during infancy or early childhood (age 3-8 years), but may persist through adolescence to adult years. Affected children may also have intellectual functioning impaired as well as face behavioral problems and delayed development. Symptoms consist of different types of seizures and neurological malfunctions. Amidst the seizures, the more common are the tonic and atonic or “drop” seizures. Less common forms of seizures occurring in the condition include myoclonic, tonic-clonic, status epilepticus and nonconvulsive status epilepticus seizures. Although in most cases, the causes are identifiable, yet the exact mechanisms that bring about the seizures are not known, and more researches need to be done to derive a genetic basis of the syndrome. The diagnosis of LGS is based on the identification of the clinical triad that comprises of multiple seizures, an abnormal EEG with a significant spike-wave pattern of the brain and some degree of cognitive and behavioral dysfunction. An advanced imaging technique such as MRI is also done to get three-dimensional images of the brain anatomy. Diagnostic form with diagnosis lennox-gastaut syndrome and pills. Valproate, which may be given alone or in combination with other drugs like lamotrigine, topiramate or clobazam. Though valproate is beneficial for all types of seizures, yet it has side effects such as tremors or reduction in platelet counts. Another drug of choice, topiramate may help lessen both drop attacks and multiple seizures but an increased dose can have side effects like sleepiness and ataxia. Clonazepam, the most commonly used representative of the benzodiazepine class of drugs may have partial effect in myoclonic seizures. Lamotrigine seems to be efficient in multiple seizures as well as a mood stabilizer. Felbamate may help promote alertness, but it too can induce aplastic anemia. FDA has approved Levetiracetam for partial seizures, but it may prove efficient in other seizures too. Rufinamide (Benzel) is used as an adjunctive therapy for adults and children aged one or above having seizures. Occupational therapy, speech and physical therapy are the rehabilitation procedures that may help children suffering from the syndrome in reducing the levels of disability. However, since the above mentioned drugs may lose their effect with the passage of time, the condition may be treated with the help of another approach called the ketogenic diet. This strict high fat, low carbohydrate diet is initiated after a 24-hour fasting, intending to raise the ketone level in the brain. By restricting an intake of carbohydrates, this diet forces the body to burn fat to get energy instead of sugar. Followed under the strict supervision of a doctor and dietician, it does not prevent the use of medications. Vitamins and minerals may be supplemented to avoid a deficiency. Though proving effective in a minority of patients, it may have side effects like dehydration, constipation, kidney stones and vomiting. Patients not responding to either medications or dietary therapy undergo a surgical procedure called corpus callosotomy. This surgery, accomplished by cutting the large bundle of nerve fibers called the corpus callosum that connects the two hemispheres is done to reduce the severity of drop attacks, tonic, and tonic-clonic seizures. According to several studies, in 50- 70% of cases, partial callosotomy is beneficial whereas complete callosotomy may result in the decrease of drop attacks in about 80-90% of cases. This surgery lasting for about an hour and usually conducted under anesthesia, involves the insertion of a device called a pulse generator into the chest to transmit mild, electrical impulses to the brain through the vagus nerve. This process, intending to reduce the frequency of the seizures may have side effects such as voice hoarseness, tickling in the throat and coughing. The other surgical procedures are RNS stimulator, deep brain stimulation, and trigeminal nerve stimulation. Intravenous Immunoglobulin (IVIG): IVIS is a blood product that can be given intravenously in the treatment of LGS. Medical Marijuana/CBD (Cannabidiol): A compound called cannabidiol found in cannabis might reduce chemical as well as electrical activity that occurs in the brain and thus may be used therapeutically for patients living with LGS. The annual incidence of children having LGS is about 2 per 1000,000 children. Nearly 1-2% of all childhood epilepsies are represented by LGS. Amidst this, 75-90% children suffer from mental retardation which generally begins within a few years of the onset of the syndrome. The prognosis of this progressive syndrome varies with individuals. Seizures continue in more than 80% of patients. MRIs and other clinical exams may occasionally be repeated to look for any change in the brain. The mortality rate of the syndrome ranges from 3% to 7% with most of the deaths occurring from accidents. The degree of disability may be lessened with early and useful treatment. Recovery also depends on the combined efforts of health care providers such as social workers and neuropsychologists. The icd-9 code for LGS is 345.0 and the ICD- 10 Code is G40.814.